I haven't posted anything for a long long while. I've been trying to get myself closer to normal and this in turn takes away from my time at the computer. It's time to move this forward though and I am starting right here, right now. My sis, booked the Activity Centre for March 01, 2013 for our next PJ Day and I have a few things that I'm massaging in my head as far as raising awareness and also raising funds. I have been hearing of way too many young people getting diagnosed with this crappy disease that is normally a fifth decade of life disease. This has to stop and in my heart of hearts I think we can stop it by stopping and focusing on all Autoimmune Diseases, not just this one. 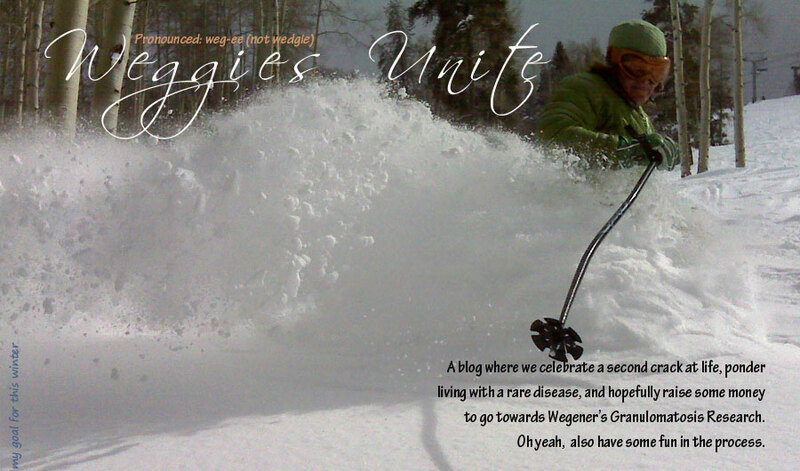 I will continue to make this site a place where Weggies can come and get some references and feel more empowered when they are meeting with the myriad of doctors that becomes the norm in our lives after diagnosis, but I am focusing my efforts on pushing the right buttons to get more research into finding the common thread of all autoimmune disease. I feel that we can find this in my lifetime. I want to go to my grave knowing that my beautiful little girl is safe from the genetic time bomb I have passed onto her. This is my mission, and I will work to that end until my dying breath.